Mo's Katy Perry, now Winky, was adopted by Michelle and Isaiah in West Chester. If they look familiar they just adopted Dobby (Moven Monte)last week, he needed a friend and Winky was the chosen one to live the good life with him. 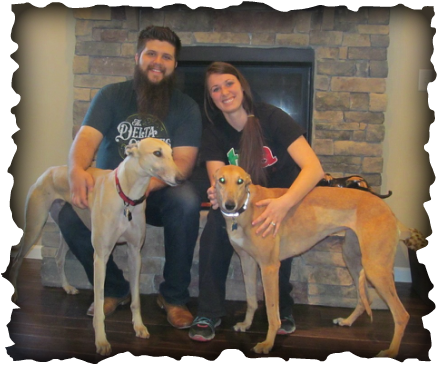 This couple is thrilled to have two greyhounds as part of their family. Like so many of us who have multiple greyhounds, they are like potatoe chips, "you can't have just one"